You’re sure you’ve seen it before. Maybe an ad in a computer magazine in the nineties? Maybe a music video? Surely a movie somewhere – Johnny Mnemonic? Max Headroom? One of those things. 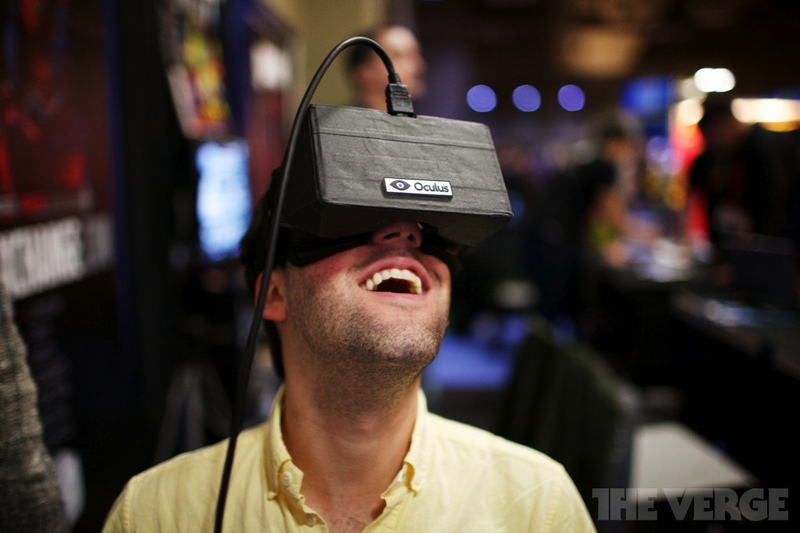 The Oculus Rift, its presence reinforced by the foreboding name (”a rift? What’s coming out of the rift? I don’t want to fall into the rift!”), is an artifact that is both from a shared recollection of a future that never was and a herald of a future that is, in fact, right here. We have thought about “cyberspace” and virtual realities since the late eighties and early nineties, wondering how it would work, what it would be like, and what would be the benefits. Having test-driven the development kit edition of the soon to be launched virtual reality device, I’m both convinced and intrigued. I am convinced because it works. You put on that helmet and your brain immediately just accepts it: this is how the world now works. When you hear you coworkers talking around you, they are disembodied demon voices, coming from wrong angles. It’s exciting and unsettling and undeniably new. You may have heard about the low resolution, but it still surprises you how low it really is. In a technical sense, this is the most rudimentary, primitive virtual world you’ve seen since the original Half-Life. It’s also blurry, which may have been due to the set being adjusted for other people’s eyes. But in a minute or so it doesn’t matter. It turns out humans are really good at adapting to a changing sensory input. The way the virtual world reacts correctly to your head movements is crucial to the immersion – I’m hesitant to call it an illusion, because in all the ways that matter in the moment, it is a reality you’re dealing with, albeit it only exists in your brain. When nothing you can see is in conflict with what you’re observing through your body, it doesn’t take any sort of conscious effort to slip into the experience. You forget about your real body as your mind adapts to the most pressing sensory feedback. The level of immersion is total. There are issues with HUD graphics and movement – the way your body moves differently to the way you’re used to navigating first-person 3D spaces with a controller throws your inner ear out of whack, resulting in nausea. But once developers figure out best practices, it is very easy to see that this is going to be the preferred way of playing most first-person games, from shooters to simulations. What I’m intrigued by is how much of an effect is the social aspect of interacting with screens going to have. When you’re immersed in the Oculus Rift experience, especially with headphones on, there is no way to get your attention, and indeed it is very disorienting if you’re interrupted while immersed. People are used to playing games on their TVs and monitors, but still in the company of others. I’m not sure I would feel entirely comfortable being that isolated, even if alone at home. Letting completely go of your awareness of your real-world surroundings can be scary. Any misgivings aside, there is no doubt a device like this is going to have a profound effect on immersive experiences and achieve wide-spread success. It’s going to be interesting to see if it’s going to find mainstream success, though.